Vinod Kumar is a 24-year-old professional from Rajasthan who works in a bank. He lives in Churu, a small town, with his parents. Recently he required some money for an emergency situation. He thought of approaching a bank but quickly dropped the idea both because of the urgency of the money need and also due to fear of long process. Luckily, he chanced upon Money View Loans advertisement on his Facebook page. He decided to download Money View Loans App and the rest of it was smooth sailing for him. How did Vinod come across Money View Loans? Vinod wanted quick and painfree personal loan. He saw some really good reviews of Money View Loans and decided to try it for his personal loan needs. This is how he came across Money View Personal Loans. The process was very simple and transparent. After downloading the Money View Loans app, Vinod uploaded the documents needed for approval. Within a short span of 12 hours, his loan was approved, and someone from Money View Loans customer service team called and informed him. Subsequently, he received the money in his bank account within a day. He was very appreciative of the customer service team that guided him well and resolved every query of his. He does mention that it would be more helpful to have a Toll free helpline while also saying that response to email is very efficient. Online Process: Vinod felt that it was too good to be true that the entire loan application process was completely done online. This helps people like him in far-off cities and towns of India to get loans easily. Quick Disbursal: Vinod needed the money urgently, and he got it within one day in his bank account. Money View Loans worked out perfectly for him. No lengthy procedures unlike banks: As a working professional, Vinod wanted a painfree, easy process that required minimal travel or time off from work. Money View Loans enabled him to do just that through an easy, transparent and completely online loan approval and disbursal process. Credible Loan given: Vinod could get loans from Rs. 10,000 to Rs 5 lakh within just a couple of days with Money View Loans. No collateral or hidden terms either. 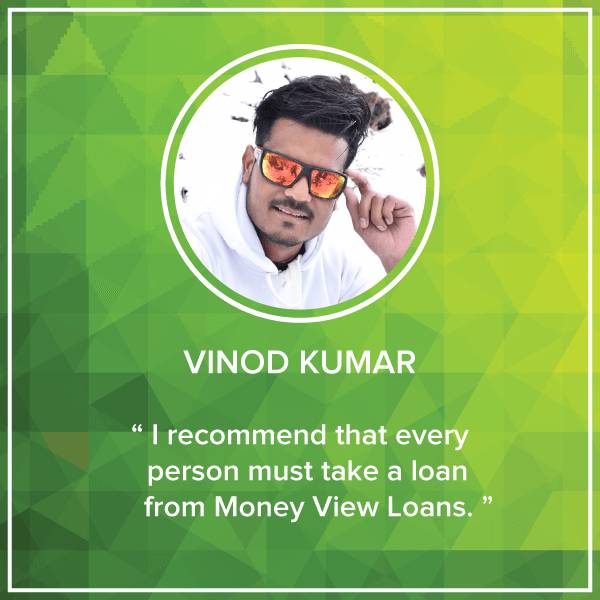 We love it that Vinod was so happy with his experience of taking personal loan with Money View that he has been recommending it to all his friends and relatives. Thank you for sharing your happy story with us, Vinod. Many More Thanks to Money View.. I applied for a Loan and within 1 day my Loan was processed and disbursed.. Specifically Thankyou to Money View Loan. I applied for a Loan from digital app through Money View. I am really Surprised because My loan application was proceed & Disbursed within 12 hours. Thank you.Glad your experience was so good. Really wonderful I con’t believe how simple it is.